This triptych, a three-page series, includes language excerpted from SPEECH, a manuscript about what to say, how to say, and if to say. SPEECH is not about censorship; rather, it is about the dawning of a new awareness, a new way of seeing and utterance that breaks with the western enlightenment concepts of depth, authenticity, individuality and agency. Fascinated by the light-absorbing flatness of textiles, the geometries of Islamic art, and of mosaics whose pieces total up to render a whole, this work explores abstraction not as a withholding of image, nor as a personal expression, but as an embrace of flatness, surfaces, repetition and rhythm. The tiny stitches made here signal time—the rhythms of the intervals of the art of applique: affixing one flat surface to another. These works are inspired by my mother’s quilts, Richard Tuttle’s and Louise Bourgeois’ fabric works, and Rachid Koraïchi’s “Invisible Masters” banners. But where Koraïchi commissioned Egyptian tent-makers to make the banners, and where Tuttle and Bourgeois situate fabric works within the context of painting, and my mother made quilts as gifts for use, I am testing out the hybrid possibilities of typeset language upon the same substrate that holds the non-verbal, color, shape, and the work of my own hand. Are these pages for a soft book? Are they meant for the wall? Are the shapes illustrations? Do the words annotate the image? Is stitching writing and is writing stitching? What are the politics of finding beauty while all around the world feels to be crumbling? I envision making a series of triptychs such as these, possibly totaling as many pages as the manuscript itself: another way to enter the time and way of seeing that this project has given to me so far. 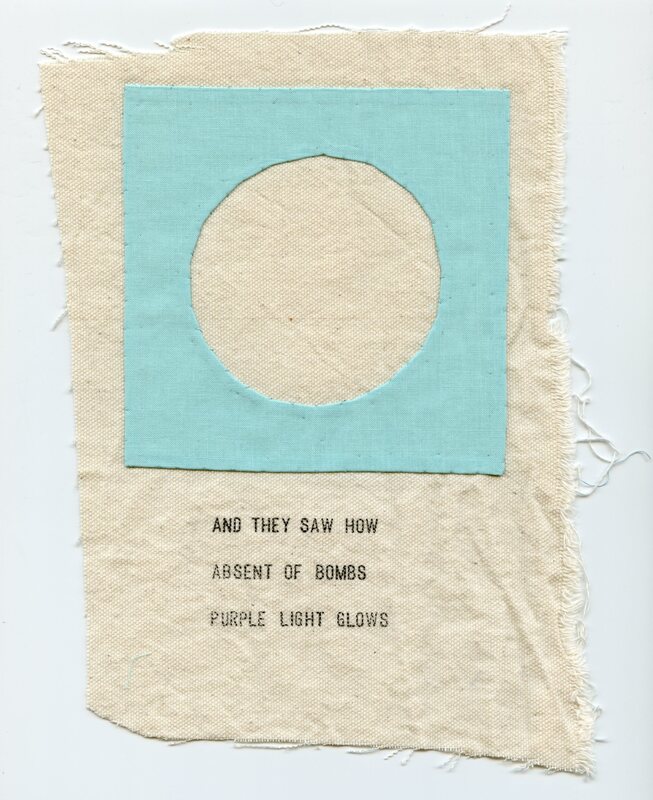 Jill Magi is an artist, writer, and educator working in text, image, and textile. She is the author of five books, the most recent of which is LABOR (Nightboat 2014), combining poetry, fiction, and image in response to the Robert F. Wagner Labor Archive housed at New York University’s Bobst Library. 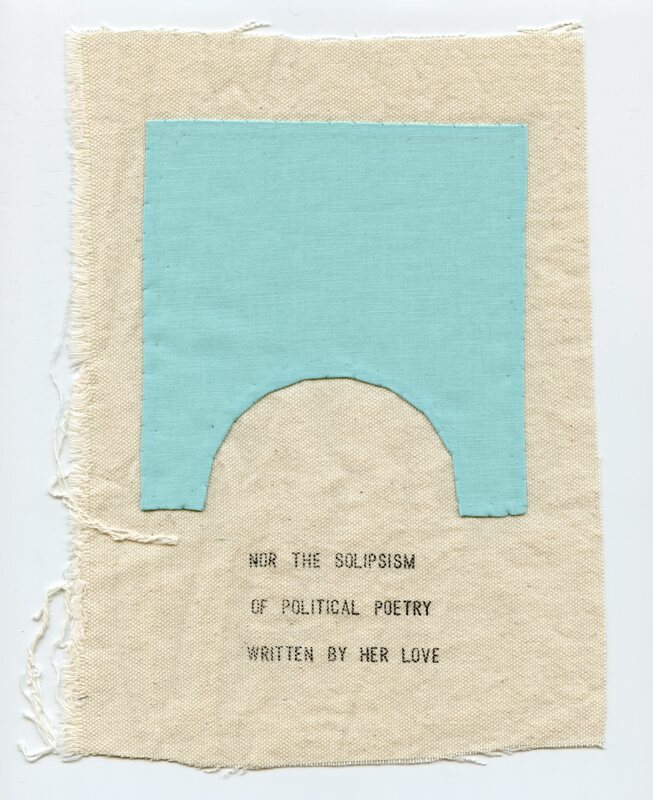 In the spring of 2015 Jill wrote weekly for Jacket2 magazine on “a textile poetics,” and other recent essays on art, poetics, and culture have appeared in The Force of What’s Possible: Accessibility and the Avant-garde, The Racial Imaginary, and The Eco-Language Reader. 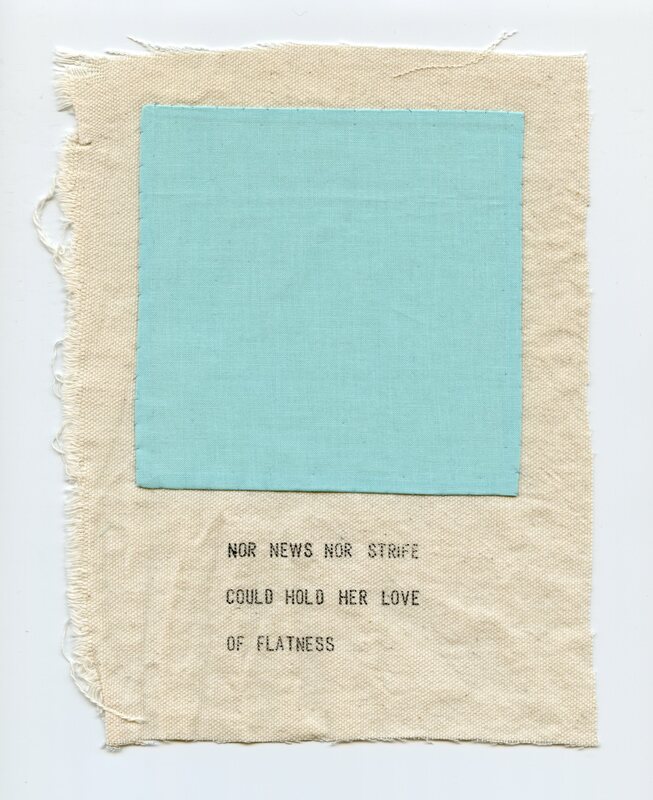 She has held residencies with the Lower Manhattan Cultural Council, the Textile Arts Center Brooklyn, and has exhibited visual work at apexart, Pace University, the Brooklyn Arts Council Gallery, and Arcade Six Gallery Columbia College. The New York University Abu Dhabi Project Space gallery mounted a solo exhibition of her work in 2015. Jill teaches textiles, poetry, and art electives at NYUAD where she joined the faculty in 2013. She is currently investigating al sadu—Bedouin-rooted weaving—architecture, walking, and place-making in Abu Dhabi.